Bulova 1970 Accutron Traveler "MKII"
I've been looking at this site for a while but never posted. Here's my first. I posted this watch since I've found very little information about it when searching. 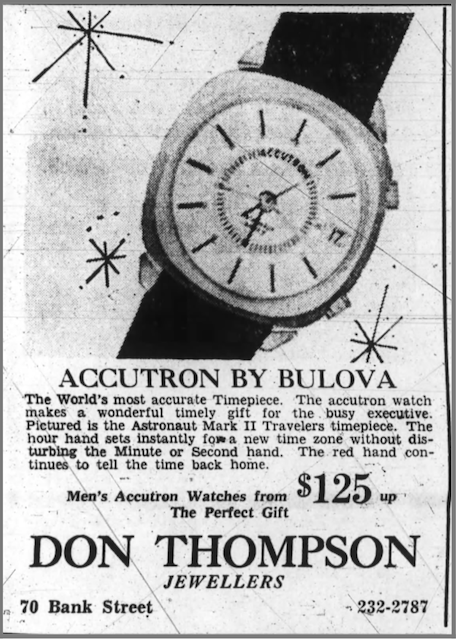 It belonged to my wife's grandfather, who was a factory manager of the watch division at Bulova, per a photograph on the 1973 annual report. Her grandmother gave it to me shortly before she died and said there was "something special" about it, but I don't know what she meant. Other watches went to direct decendants. When I have searched for Traveler Mk II it is usually grouped with Astronauts, which I think it is mechanically similar or identical to. There is an indicator hand for the home hour--pointing at 9 minutes in the photo. Hands are a sort of brass/brown color with a white stripe, although the indicator hand is all brass/brown and the second hand is mostly white. The dial is a chestnut brown, and I think slightly darker at the edges. The case is stainless steel, and it has what I assume is the original stainless band. The case has no date code, although on the exterior is possibly the case number of 401193. On the inside is "MLB 7617 Swiss" Printed in green ink is 1084. The crystal is domed plastic. The 2185 movement is stamped N0, although it is under the battery contact. It is also marked "U.S.A."
Does anyone know more about this model? I've found other ones on the internet, but no real information or advertisements. I have had it serviced before, but it is due again. Sorry about the photo rotation--they are saved 180 degrees different on my computer and I don't see a means of rotating them here. I'm not certain the difference between the Traveler and the Astronaut, both are Mark II models and offer the fourth hand (or disk) for home base. It would seem they both function the same. I don't find 'Traveler' in any ads that we have, but it would seem that is the model name, in place of Astronaut on the dial. I will agree with Ken. Very interesting watch Traveller, thanks for bringing it. Short of an advert I would normally be tentative on the ID but I think I'm all in. Sorry, I'm a little late to the party. Agreed.